Update: I (Chris) recently spotted a 2018 Chevy Camaro ZL1 1LE at the Sturgis Rally in South Dakota and had to share these pictures. One thing I learned is that the ZL1 doesn’t actually say “1LE” anywhere on it! Chevy sells it as an “Extreme Track Package”. The 1LE also has lots of carbon fiber but the only “exposed” parts are the supercharger hood cover and the spoiler. Check the pics of this red one below! Living in Detroit, Michigan may sound worrisome but it also comes with its perks. One being you get to see all of GM and Chrysler’s concoctions driving around at any time. 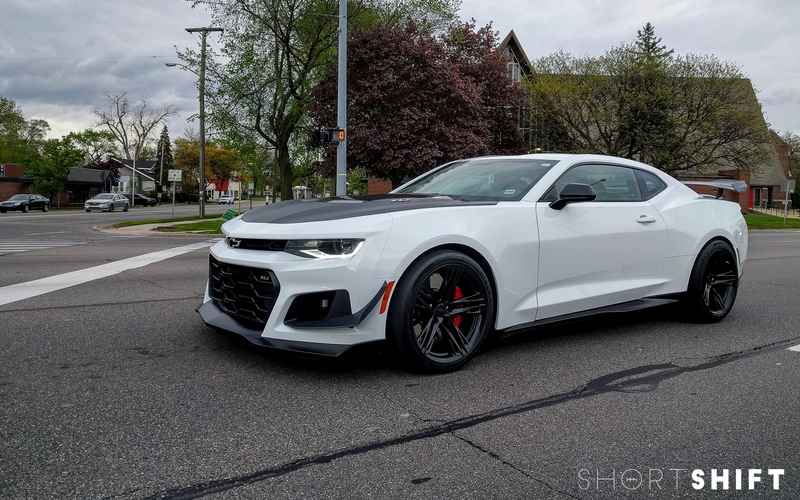 Steve is on a roll this month with his latest spot; the not yet for sale 2018 Chevrolet Camaro ZL1 1LE. This isn’t your standard V8 toting Camaro, either. The ZL1 is a purpose built $60,000+ track car. It has a 650 hp 6.2 liter V8, magnetic ride technology, tons of aero, and ample carbon fiber. Inside makes you feel just as special with more carbon fiber, red stitching and special ZL1 badged Recaro seats, and your choice of a 6-speed stick shift or 10-speed with paddle shifters. The 1LE, however, takes it a step beyond that. It has more aero, a carbon fiber wing, adjustable suspension, exclusive wheels that are lighter and 1 inch wider, Goodyear Eagle F1 Supercar 3R tires designed specifically for this car, and about 60 lbs lighter than the standard ZL1. Chevy also claims the 1LE is 3 seconds faster around their testing track than it’s brother. With upgrades like this, assume Chevy will charge a premium for the 1LE package. Expect to see the 2018 Chevrolet Camaro ZL1 1LE on the road (and tracks) later this year.